Edit: There is now an option in the resource manager that allows you set the minimum TLS version to 1.2. Disabling SSL and early TLS is a PCI Compliance requirement. After several research, trial and errors, I have put up this guide that will help you achieve this without using an App Service Environment (ASE). To pass PCI Compliance, your host needs to have SSL and TLS 1.0 disabled and support only TLS 1.2 or later ( lastest version is v1.2, with TLS 1.3 currently in draft ). Now according to the Azure team, App Service is using a shared infrastructure, and the only way to disable this is to do so across board — which they can’t because there’s a surprising number of customers that still require it. 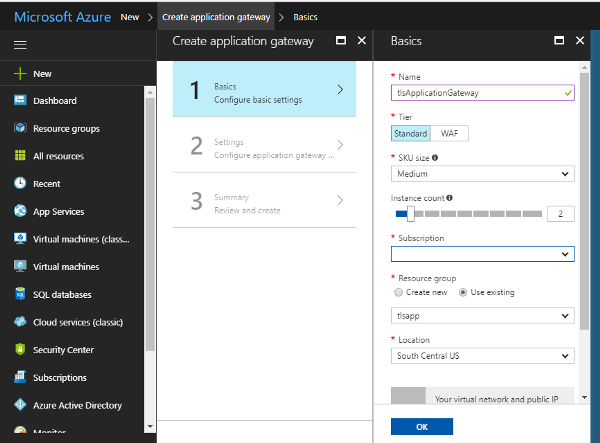 Application Gateway is one of the different options to distribute network traffic in Azure — It is a load balancer. Prerequisite: You have an existing Web App and a domain with access to modify DNS records. You can read up on creating a Web App here . 1, Get your passworded PFX — Usually your Certificate Authority (CA) — where you bought your SSL/TLS certificate from — should provide you this. 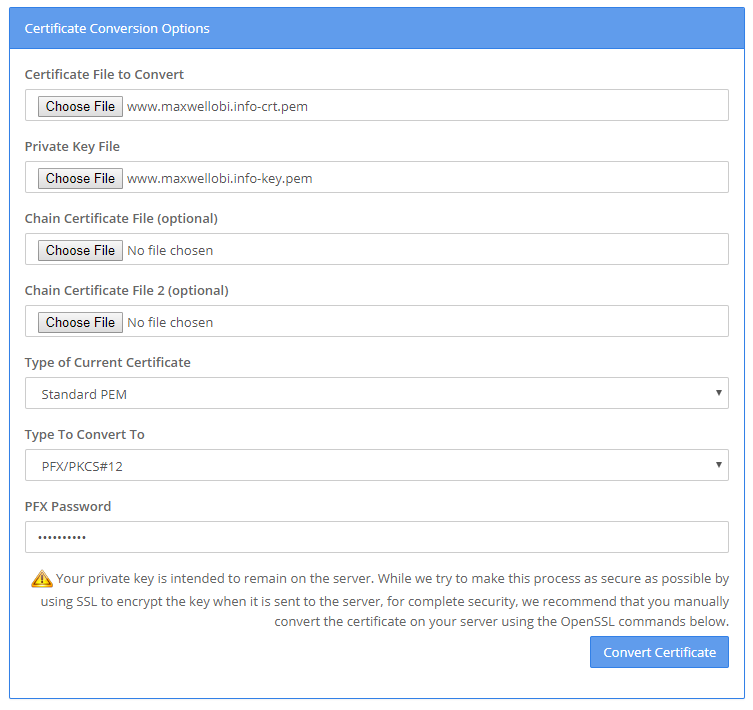 If you are using free ssl from letsencrypt ( as i did here) then you’ll have to convert the certificate files to pfx using this ssl converter. Navigate to /SiteExtensions/letsencrypt/config and download the certificates. Upload the files <domain>-crt.pem and <domain>-key.pem , select PFX/PKCS#12 as the format to convert to and choose a password. Go to your registrar and point your A record to the public IP you just created. This IP is attached to your Application Gateway. 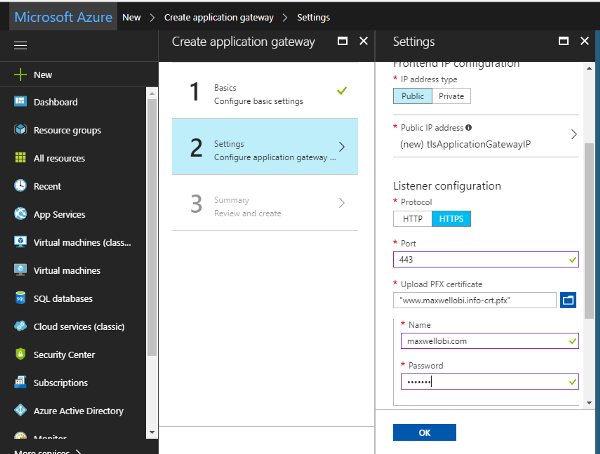 Enter the Azure generated domain for your Web App <webapp>.azurewebsites.net and save. 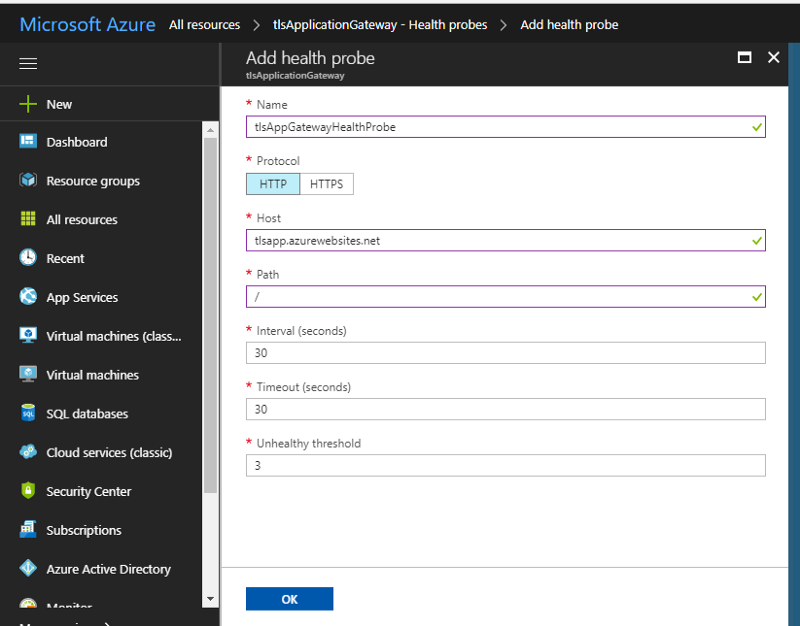 Go to Health probes to add a custom probe. Enter a name and select HTTP as the protocol. Use <webapp>.azurewebsites.net as the host and select the root path (/) then save. After your custom health probe has been created, go to HTTP settings, select Use custom probe then choose the probe you just created. You can try browsing your domain now and verify that it works fine and the https lock sign is not crossed on your browser. If you get a 502 error, remove all redirect rules from your web config. Note: From the setup, your Gateway is listening only on port 443, browsing the site without https will not work. If you run an SSL test, at the Configuration section, you can see that TLS 1.0, 1.1 and 1.2 are all supported. We are going to support only 1.2. Disabling TlS can only be done only via Azure PowerShell. Make sure you have the latest version installed. The last command will take some time to complete. Once its done, run another SSL test, you should see only TLS 1.2 supported. For the most part you are done, but your web app is dead on HTTP. A simple server redirect rule in your web config will conflict with your Gateway’s internal routing rules and cause a 502 bad gateway error. Note: Make sure you have the latest version of Azure PowerShell installed. Some of the commands might not work with older versions. That’s it. Now check out the redirect on your browser. To redirect www to non-www simply add a www CNAME record and point it to your Web App’s azure assigned domain <webapp>.azurewebsites.net . The Application Gateway will handle the redirect.